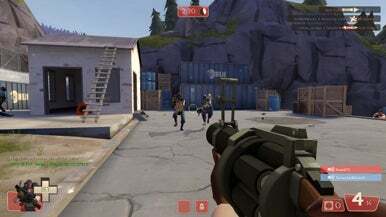 Valve’s promised Wednesday updates of Steam on the Mac have been delayed, but Mac gamers get a bit of good news this Wednesday from the Team Fortress 2 blog, which announced that the team-based multiplayer shooter will be available for download on Steam for the Mac this Thursday. But Mac gamers can at least comfort themselves with some great multiplayer combat. Team Fortress 2 has one of the most unique art-styles of any game out there and one of the most balanced class systems of any multiplayer game ever made. Imagine a Norman Rockwell painting that’s trying to kill you. That’s Valve’s unique team-based multiplayer shooter Team Fortress 2 in a nutshell. Thanks to frequent updates and a great community, 2007 team-based first-person shooter has had remarkably staying power in a market saturated with great multiplayer FPSs. Soon Mac users will be able to enjoy one of the more unique weapons in Valve’s arsenal. Steam lists the price for Team Fortress 2 as $20; look for it to arrive sometime Thursday. Lock and load.